If you’re ready for a new car experience, stop by island Mazda in the Staten Island, New York area to compare the 2017 Mazda6 Vs. 2017 Hyundai Elantra. Mazda’s new technology, SKYACTIV-VEHICLE DYNAMICS with G-Vectoring Control, helps achieve a smoother, less fatiguing drive for you and your passengers. It’s a highly efficient vehicle motion control system that operates in the background during a spirited drive. When cornering, the system works seamlessly by adjusting power delivery, shifting vehicle weight on initial turn-in and throughout the corner. The effect is subtle, but how you feel after a great drive isn’t. Why go to these lengths? Because we believe no detail is too small when it comes to making driving better. The SKYACTIV®-Drive 6-speed automatic shifts smoothly and quickly for steady acceleration. Its advanced control module ensures precision, responsiveness, and efficiency. Built for drivers who love the feel of a manual, the SKYACTIV®-MT 6-speed manual transmission’s short-throw is inspired by the legendary Mazda MX-5 Miata. The SKYACTIV® platform, consisting of the body and chassis, is at the center of the Mazda driving experience. The chassis achieves two seemingly contradictory goals at once: nimbleness at low speeds and stability at high speeds. The framework incorporates ultra-high-tensile-strength steel in critical areas to help make it lighter, yet stiffer and stronger. Elantra has a 2.0L Atkinson cycle engine that delivers more standard horsepower than 2016 Toyota Corolla and 2016 Nissan Sentra. There’s no reason to just sit there when you can get up and go in an Elantra. Elantra is the only vehicle in its class to offer an available hands-free smart trunk. When you’re loaded down with boxes and bags, you’ll love how it helps out. It’s a must-have feature for serious shoppers everywhere, but especially handy in the parking lot. Now, you don’t have to buy a bigger car just to get the advanced safety features you want. Elantra makes them an affordable option. Available features such as Lane Departure Warning with Lane Keep Assist and Smart Cruise Control give you the support to be a safer driver. 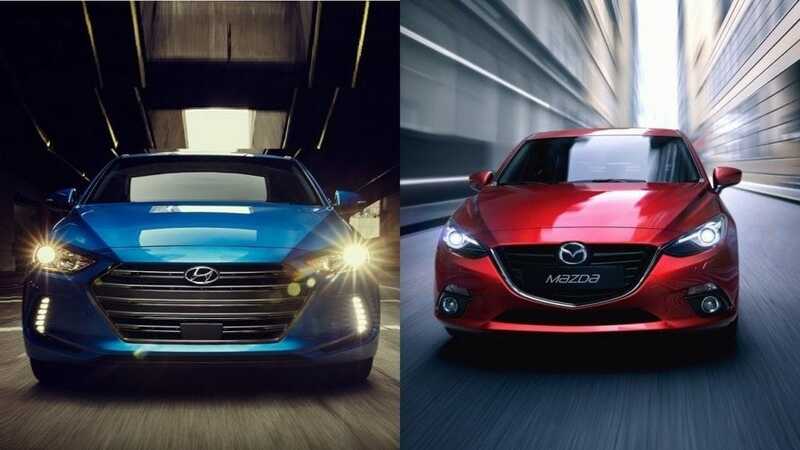 Don’t hesitate any longer to stop by Island Mazda near Staten Island, New York to compare and test drive the 2017 Mazda6 Vs. 2017 Hyundai Elantra.